South Africa, officially the Republic of South Africa (RSA), is the southernmost country in Africa. It is bounded on the south by 2,798 kilometres of coastline of Southern Africa stretching along the South Atlantic and Indian Oceans with population close to 56 million people. It is the southernmost country on the mainland of the Old World or the Eastern Hemisphere. It is the only country that borders both the Atlantic Ocean and the Indian Ocean. About 80 percent of South Africans are of Sub-Saharan African ancestry, divided among a variety of ethnic groups speaking different Bantu languages, nine of which have official status. The remaining population consists of Africa's largest communities of European (white), Asian (Indian), and multiracial (coloured) ancestry. Dutch traders landed at the southern tip of modern day South Africa in 1652 and established a stopover point on the spice route between the Netherlands and the Far East, founding the city of Cape Town. After the British seized the Cape of Good Hope area in 1806, many of the Dutch settlers (the Boers) trekked north to found their own republics. In 1961 became independent. 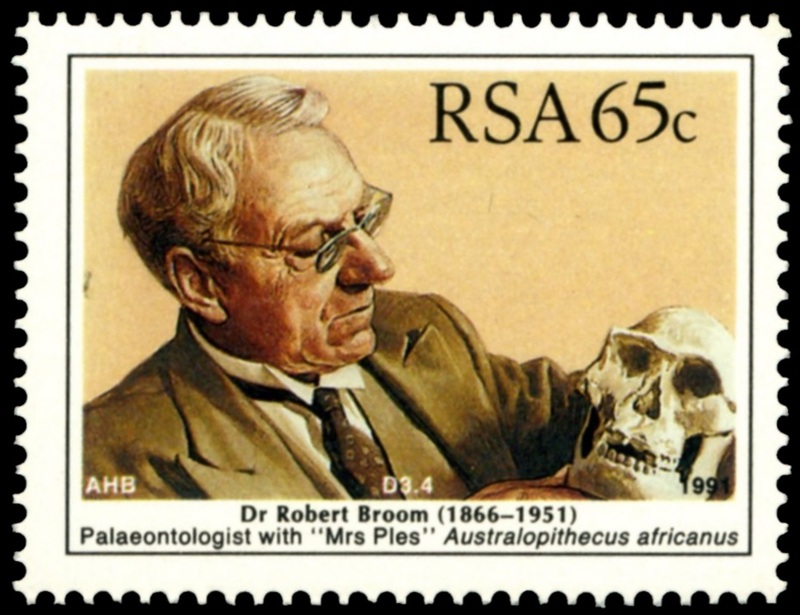 One of the stamps shows famous Paleontologist and Paleoanthropologist Dr. Robert Broom who published numerous papers on fossilised remains of mammal-like reptiles which inhabited the Karoo more than 200 million years ago. His research showed that these remarkable fossils were in fact a link between reptiles and the earliest mammals. 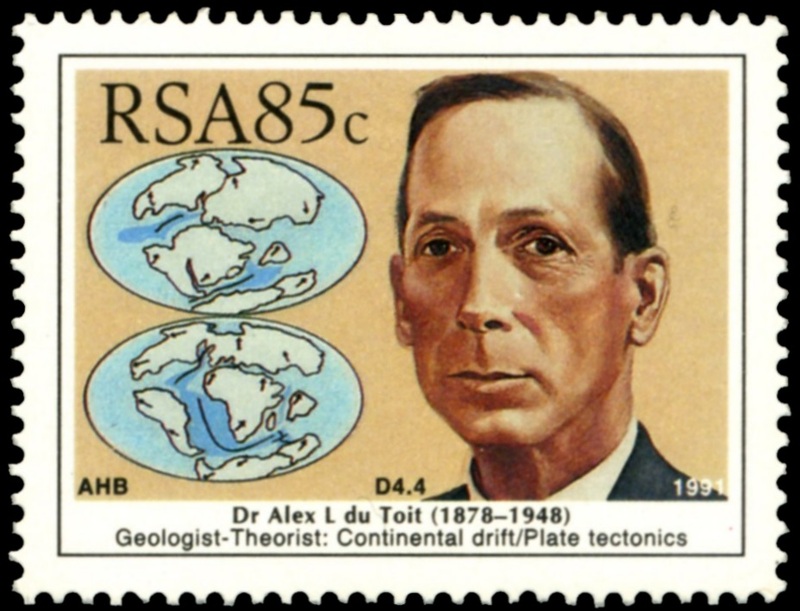 In 1934 he accepted a post at the Transvaal Museum in Pretoria, where he undertook research on hominid fossils from Sterkfontein and other sites near Krugersdorp. Awell-preserved skull discovered at Sterkfontein in 1947 was given the nickname Mrs Ples, after the genus Plesianthropus (almost manl. It is thought to be about 2,5 million years old. the theory of the history of the earth's crust in terms of continental drift and plate tectonics through his book, OUR WANDERING CONT/NENTS: An Hypothesis of Continental Drifting (Edinburgh, 1937). 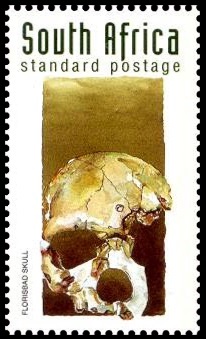 Skulls of Florisbad (Homo sapiens) and Taung child (Australopithecus africanus) shown on some stamps of the mini sheet. The Florisbad Skull has often been classified as Homo helmei. According to Oppenheimer, Homo helmei was relatively the same size as modern humans, with a slightly larger brain volume of 1,400 cm3. They are associated with the start of the most important revolutions in human technology. The skull was also found with Middle Stone Age tools. The Florisbad skull comprises the right side of the face, most of the frontal bone, and some of the maxilla, along with portions of the roof and sidewalls. More info is on Wikipedia. The Taung Child (or Taung Baby) is the fossilised skull of a young Australopithecus africanus. It was discovered in 1924 by quarrymen working for the Northern Lime Company in Taung, South Africa. Raymond Dart described it as a new species in the journal Nature in 1925. More info is on Wikipedia. 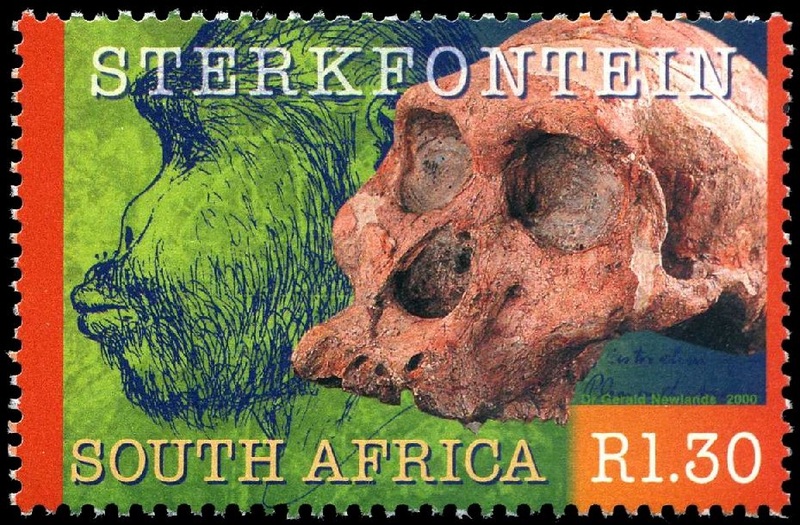 Fossilized skull and reconstruction of 'Sterkfontein' (Australopithecus) shown on the green stamp. Sterkfontein is a set of limestone caves of special interest to paleo-anthropologists located in Gauteng province, about 40 km (23 miles) Northwest of Johannesburg, South Africa in the Muldersdrift area close to the town of Krugersdorp. Sterkfontein is a South African National Heritage Site and was also declared a World Heritage Site in 2000 and the area in which it is situated, was named the Cradle of Humankind. The Sterkfontein Caves are also home to numerous wild African species including Belonogaster petiolata, a wasp species of which there is a large nesting presence. Numerous early hominin remains have been found at the site over the last few decades. These have been attributed to Australopithecus, early Homo and Paranthropus. More info is on Wikipedia. Full name of the set is "Dinosaurs - 3D Dinosaurs stamps - Where pre-history meets modern technology". 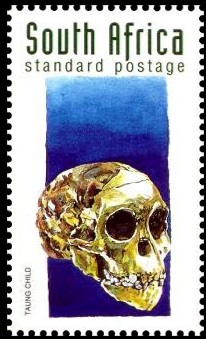 Five of the stamps depict skeletons of different types of dinosaurs, while the other five stamps show images of what scientists believe these creatures most probably looked like. All the dinosaurs depicted on the stamps have an African connection. 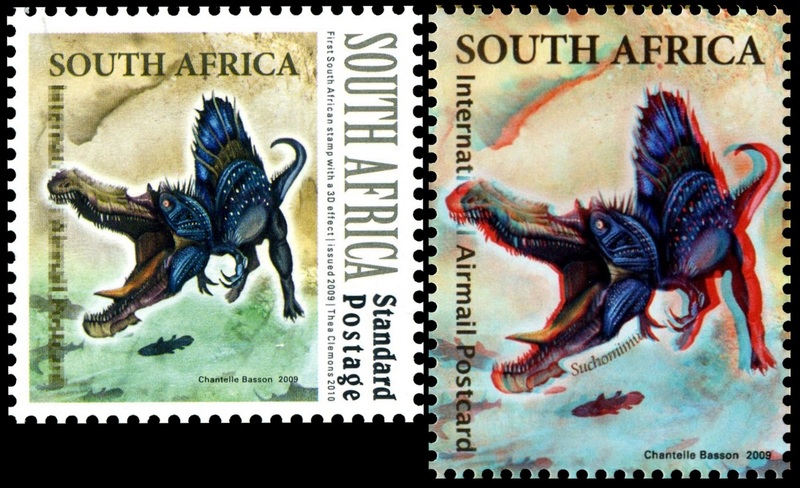 This set of self-adhesive dinosaur stamps is the first ever with a 3D effect to be issued by the South African Post Office. It is the first time that a pair of viewing glasses supplied with each stamp sheet and commemorative cover.The method used to create this effect, is known as an anaglyph. An anaglyph is a stereo image that requires special glasses with red and green (or blue) lenses for 3D viewing. To achieve the effect, two views of a picture are printed in two colours, usually red for the left eye and blue or green for the right eye. The stamp in bottom-left corner shows Suchomimus dinosaur, reprinted from the 2009 3D dinosaurs issue. See both stamps on the right side. The word Suchomimus means crocodile mimic and is derived from the dinosaurs resemblance to crocodilians that ate mainly fish. Suchomimus was a large fish-eating animal, which is believed to have grown to about 12 metres long. It occurred along the riverbanks and lakeshores of inland Africa during the late Cetaceous period, which is the geological time period from about 144 to 65 million years ago. Homo naledi is an extinct species of hominin, which anthropologists first described in 2015 and have assigned to the genus Homo. In 2013, fossil skeletons were found in the Gauteng province of South Africa, in the Rising Star Cave system, part of the Cradle of Humankind World Heritage Site about 50 km northwest of Johannesburg. More details are here. Another stamps to consider: fossil fpund places, "living fossils"
[A1] On 20 February 1939, the stunning announcement was made that a Coelacanth (Latimeria) had been caught off the Chalumna River mouth near East London (a city in RSA). At that time, the Coelacanth was thought to be extinct for nearly 70 million years. The drama commenced on 22 December 1938, when Capt H Goosen, skipper of the trawler Nenrine, brought ashore a peculiar metallic-blue, heavily-scaledfish with fins resembling legs. Miss Marjorie Courtenay-Latimer, Curator o the East London Museum, was informed of the strangie catch, but was unable to identify the fish, which measured 1,5 m in length and weighed 57 kg. "Searching for African Coelacanths" exhibit of Susan Bahnick Jones explain the story of the "leaving fossil" discovery. [A2] Addo Elephant National Park. Landscapes of Addo Elephant National Park shown on South African stamps of 2013, part "Rock Formations and the Cederberg" of and 2014 part of "South African National Parks I". South Africa's first complete dinosaur fossil was excavated in the Addo Area and dinosaur discoveries take place from time to time. Kirkwood is the largest town on the Greater Addo Route, is also home to the fossil of a small meat eating dinosaur of Nqwebasaurus specie, nicknamed Kirky. The fossil was described in 2000 as one of the most complete and best preserved specimen thus far, the fossil also contained gastroliths in its stomach (gastroliths, also called a stomach stone or gizzard stones, is a rock held inside a gastrointestinal tract). Landscape of Kruger National Park shown on South African stamps of 2014 part of "South African National Parks I". Landscapes of Karoo Elephant National Park shown on South African stamps of 2013, part "Rock Formations and the Cederberg", 2014 part of "South African National Parks I", 2017 part of "South African National Parks III"
The Karoo is a semi-desert natural region of South Africa. There is no exact definition of what constitutes the Karoo, and therefore its extent is also not precisely defined. The Karoo is partly defined by its topography, geology, and climate — above all, its low rainfall, arid air, cloudless skies, and extremes of heat and cold.The Karoo also hosted a well-preserved ecosystem hundreds of million years ago which is now represented by many fossils. he uniqueness of the Karoo Basin, as it is known to geologists, lies partly in the fact that its 50-million-year fossil record, covering a period from 240 to 190 million years ago, is largely unbroken, so that the intricate evolutionary pathways followed by different animal groups through time can be more closely traced than in other fossil-bearing systems of rock strata. In the true paleontological sense, therefore, the 'Karoo' is more than just a geographical area: the element of time is inextricably woven into the meaning of the word. Some prehistoric animals which fossils found in Karoo depicted on South African stamps from 1982. Landscape of Golden Gate Highlands National Park shown on South African stamps of 2017 part of "South African National Parks III"
The outstanding features of Golden Gate are the rocks, whose formation started as far back as 200 million years ago. The glowing golden colour of the sandstone cliffs facing each other on either side of the road at sunset led to the name Golden Gate. Numerous paleontology finds have been made in the park including dinosaur eggs and skeletons. The oldest dinosaur embryos ever discovered were found in the park in 1978. The eggs were from the Triassic Period (220 to 195 million years ago) and had fossilised foetal skeletons of Massospondylus, a prosauropod dinosaur. Landscape of Table Mountain National Park shown on South African stamps of 2017 part of "South African National Parks III". Table Mountain National Park is part of the Cape Floral World Heritage Site. It is one of the Seven Natural Wonders of the World and one of the most beautiful spots on the African continent. It covers an area of about 60km from across the Cape Peninsula right up to Cape Point, with Table Mountain and the Cape of Good Hope as its crown jewels. Table Mountain National Park is home to an astonishing array of rare plant life, fynbos and different variants of protea. The park is also home to penguins, birds one would normally expect to find near Antarctica. Southern right and humpback whales visit the coast between August and October. These rocks are believed to have originated in shallow tidal flats, in which a few Ordovician fossils, and fossil tracks have been preserved. Landscape of Ai-Ais-Richtersveld Transfrontier Park shown on South African stamps of 2016 part of "South African National Parks II". [R3] "Exciting new East Cape dinosaur finds" , "Addo Elephant Park History" , "Nqwebasaurus"